So today I went looking for some information about pyrite and found this gem lore site I hadn't run across before -- it's a pagan-oriented site with a section called "Stones -- History, Myth and Lore." Unlike many sites, only a select few stones are listed, and I like that the lore included isn't the usual "greeks and romans" stuff, but includes also Asian lore and stories from the indigenous Americas. I also like that the author delves also into the scientific aspects of the stones, a topic she seems comfortable with and knowledgeable about. I could not for the life of me find the little chacha rings I'd made, one of which sold. (yay!) I reorganized everything on my work table in case I'd inadvertently set it there. Stayed up late putting things away and triple-checking my Etsy inventory drawers. No chacha rings. So I set out the materials to make another one, and finally went to bed. The next morning I got up and re-inventoried everything in my Etsy drawers against what I've got in my shops, and lo and behold, found both the rings. Whew! I tend to keep things in little paper plates or bowls. They're cheap, eh? They double as paint trays, glue puddle holders, portable organizers. 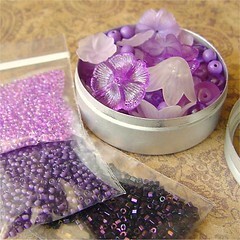 I had a plate for seed beads to put away. I had a bowl of tiny vials of sterling silver components. 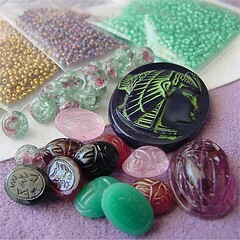 Stacked bowls with gemstones and the findings to make them into bracelets. A neat little tray of pairs of earrings waiting for me to make sterling earring wires for. By golly, I haven't been this organized in . . . well, a very long time. So today I come home from work and immediately noticed the dog is trotting out of the computer/jewelry table room, instead of sneaking off the couch before we bust her. I'm like, wha??? She is always at the door to greet us. Today she comes barrelling around the corner in bark mode. To my great and utterly depressing dismay, I see that for some strange reason (bird? peeping tom? low flying hot air balloon?) she has jumped onto my once-in-a-lifetime-tidy worktable and swept EVERYTHING off onto the floor, in order to CLIMB UP on the windowsill (this is an adobe house, my windowsills are a foot deep) where she managed to knock off some antique bottles I use to photograph earrings. Can't blame the dog. She's normally so mellow you'd think she was on medication. My kid says she probably scared a burglar away. He's probably right. And now . . . for the cleanup. See ya in a few days . . . 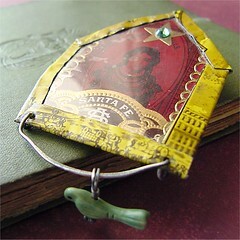 Recycled vintage tin "house" pin with vintage ephemera collage. Hammered and antiqued sterling silver wire, vintage carved turquoise bird. Ya know, a lot of times people "in the biz" feel a certain pressure to behave in public. When a vendor, designer, author, teacher, or otherwise well known person in the industry (and I'm sure this is true for other art/craft genres) speaks too frankly, speaks too honestly, speaks their true feelings, there is an inevitable backlash. Especially on the Internet. But Sig, though sweet as pie, generous as the day is long, and warm as a teddy bear in person, has generally elected to speak her mind no matter what and it doesn't seem to have hurt her any. Until now. I am fairly certain she's completely flipped her lid and lost her marbles! One too many rows of odd-count flat peyote? Miz Sig, in case you haven't heard, is now on Chapter 6 of the Cracked Bead, a tell-it-like-a-veteran-designer-sees-it "journal" of things some of us wish we'd said others of us might wish she hadn't. Oh and if you feel the need to catch up, the rest of the Chapters are still online too. The lilacs are in bloom all along my street. They're the inspiration for this new palette. 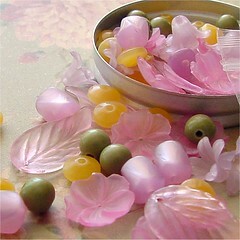 Pretty vintage lucite beads, mostly flowers, in lavender, lilac, and violet. Brand new and in my Etsy shop. Photo reshoots, in my Etsy shop. More photo reshoots, in my Etsy shop. A lovely palette of lustrous pinks with a bit of olive/sage and butterscotch. Old fashioned colors, genuine lucite. So hey! Mixed media artist Karen Ventura produces the Indie Arts DVDs, profiles of talented and well known artists, and you can see some of them in action at YouTube. You can see and hear folks like Michael deMeng, Meredith Arnold, Gail Reike, Nick Bantock, and others. New Poll: What Earrings Do You Wear? I was going to make April's poll about your fave items in my Etsy jewelry shop but I was a little uncomfortable with that and kept procrastinating. Not because I was worried about feedback -- I still want feedback! But because it just seemed a tad self-centered and besides most people who post here aren't my jewelry customers anyway (er, yet?). What's Hanging From Those Lobes??? I know, I forgot multiple piercings, handmade, catalog purchases, seed beads, goth, department store specials, teen Claire and all kind of other things. Feel free to add your ideas for OTHER by commenting to this post or emailing me. So there ya go. Now, look left silly and fill out the poll! Drawing on the Right Side of Your Cursor? Scroll way down to the bottom and click the appropriate exercise (Right handed or Left handed). 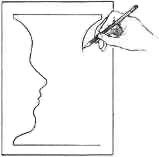 When the new window opens, you might have to click inside it once to activate the script before you can draw. Sick Bed Art from Which Continent? I've had a wicked, wicked cold (again -- something tells me full-time job + grad school don't mix, at least not in this nearly 50 year old body...) and I'm telling my DH, "Honey I'm coughing so hard I'm practically incontinent!" And Junior pipes in, "Which continent is that, Mom?" 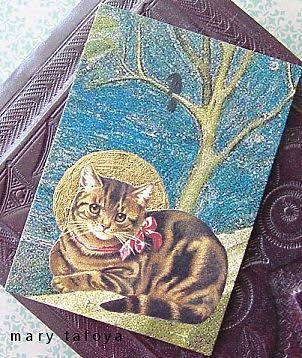 First I made envelopes out of old art magazines (the kind with the heavier paper) and the inserts are made of old rescued file folders. I mean, like, at least 20 years old, probably more like 30. 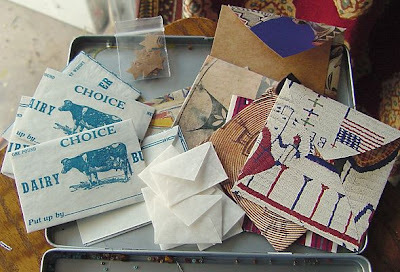 The cow envelopes are made from salvaged butter labels made of vegetable parchment paper. Reuse, recycle! 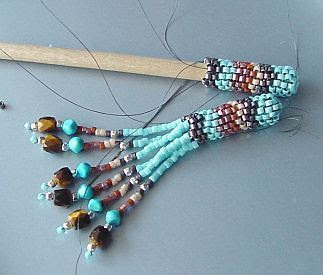 Then I finally got started on a custom peyote stitch earrings order and since I've been kinda slow to get these to mi amiga I added some special little stones, including turquoise faceted rounds and tiger eye faceted barrels. 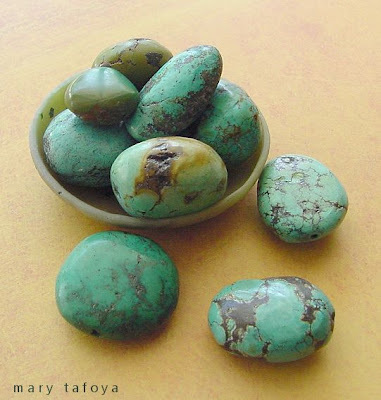 I love 'em -- they've got antique silver and bright faceted copper Delicas in the mix. Still a bit of work to do on these (obviously). 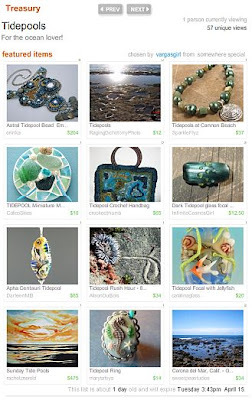 since I opened my new Etsy Shop (the seahorse ring). Some of these turquoise beads (plua a few others like 'em) are going up in my Etsy shop, little by little as I photograph, weigh (yes they're big!) and measure them... I couldn't stop taking pictures of the whole pile of them the other day, LOL! That little bowl btw is faux jade polymer clay I made in a class with Victoria Hughes. I am here to witness that the lone neatnik vote snuck in on the last day of the poll and I don’t believe them for a minute! ;-) The clear front runner throughout the month was still the winner at the end – and I have to tall ya I’m relieved to not be all alone in the “Honey have you seen my worktable?” category. Oh and btw, no, I don’t know how Google figured those percentages. They don’t make sense to me either. Pregnant Pixie Lute Playing Doll? I'm afraid the DH has got it bad. Ever since he threw that big ole boudoir doll in the bed with me after an early morning Goodwill run, he for some reason thinks I want to collect the disgusting things. A lot of times, he brings me some creepy stinky weird tourist doll (ok, maybe not stinky) and I make him throw them out immediately, I don't even want to touch them! Ahhh, but today...he comes in, sheepishly, and says, "Will you please research this one? I think she's pregnant." LOL! I kinda doubt it -- I think it's just her posture (but hey maybe if she wore some PANTS she wouldn't find herself in those compromising situations, where people judge her and all that...) Check out my Flickr album (click the photo) for some more views. No I did not research her. But she will have an honorary place out in the shed, on the shelf with his battery operated hand held mosquito repellant gadgets. I figure she was part of some 1950s split-level cocktails at 5:00 Las Vegas holiday scenario. Wonder where her pixie drummer boy friend is? When my son has an assignment to color, he usually opts to use my big ole set of Prismacolor pencils, (which, by the way, I've had since college 100 years ago). This time I mentioned I had a whopping big new bunch of gel pens, so he grabbed them instead. To tell the truth I'd completely forgotten I'd binged on the fluorescent colors too...but I'm guessing he migrated right to them. I love this drawing! 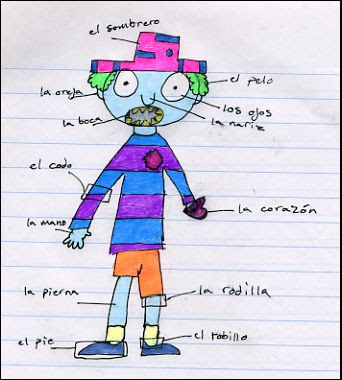 The assignment was to draw a monster and label its cuerpo. The only caveat was "No Blood." (Ahhh, an experienced teacher who knows boys all too well ;-) The ripped out heart totally cracks me up! Also in my brand new Etsy shoppe.